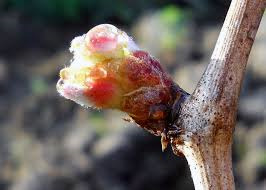 As you make the drive up the rolling hills to Villa Raffaldini you will start to see the first signs that our vines are coming out of dormancy. 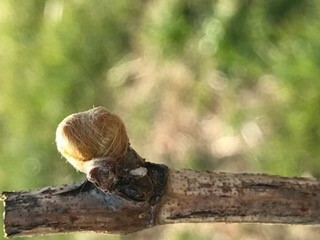 We have reached the phases of bud swell (left) and bud burst (right) in which leaves, shoots and clusters start forming. This season, you will also see the addition of 2,500 vines that include Nero D'Avola, Vermentino and Sagrantino across the vineyard. Our Vermentino Superiore earned a gold medal at the prestigious and highly-competitive San Francisco Chronicle Wine Competition. 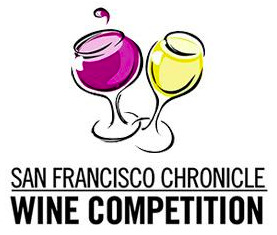 With more than 6,300 wines entered from over 28 states, the San Francisco Chronicle Wine Competition is the largest competition of American wines in the world. This newly released 2016 vintage features flavors of citrus, tropical fruit, green apple, and ocean spray. Vermentino's refreshing acidity makes it a wonderful pairing for seafood and other entreés. We're excited to announce that our very own Barbara Raffaldini is a nominee for the 2017 Governor's Volunteer Service Awards in Winston-Salem! Barbara serves on the board of Bookmarks, Piedmont Opera, and coordinates giving at Raffaldini Vineyards. Please vote for Barbara by clicking here. You can vote once per day until April 9. Help us share the word! 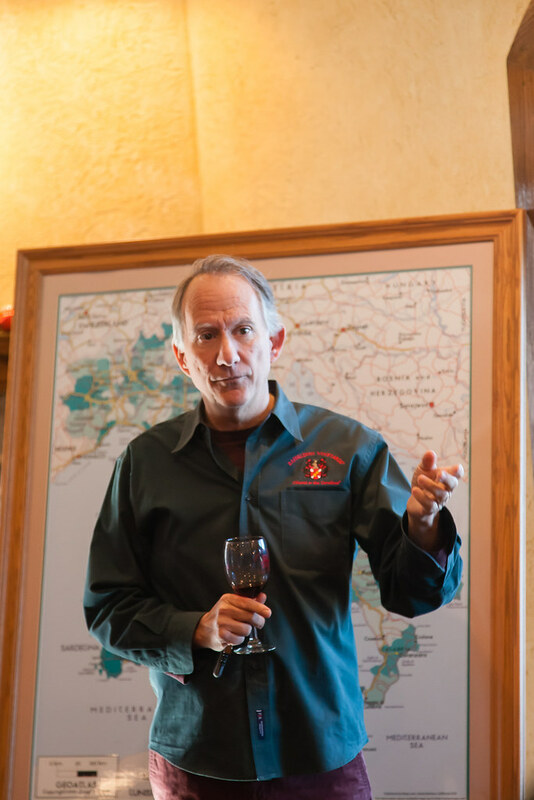 Owner and Winemaker Jay Raffaldini is speaking at this year's TEDxRaleigh conference, on Saturday, April 22 in downtown Raleigh at the historic Lincoln Theatre. TED is owned by a nonprofit, nonpartisan foundation. The agenda is to make great ideas accessible and spark conversation. TED is a global community, welcoming people from every discipline and culture who seek a deeper understanding of the world. They believe passionately in the power of ideas to change attitudes, lives and, ultimately, the world. The theme of this year's TEDxRaleigh is #Foundations. For more info and details, visit the TEDxRaleigh web site. 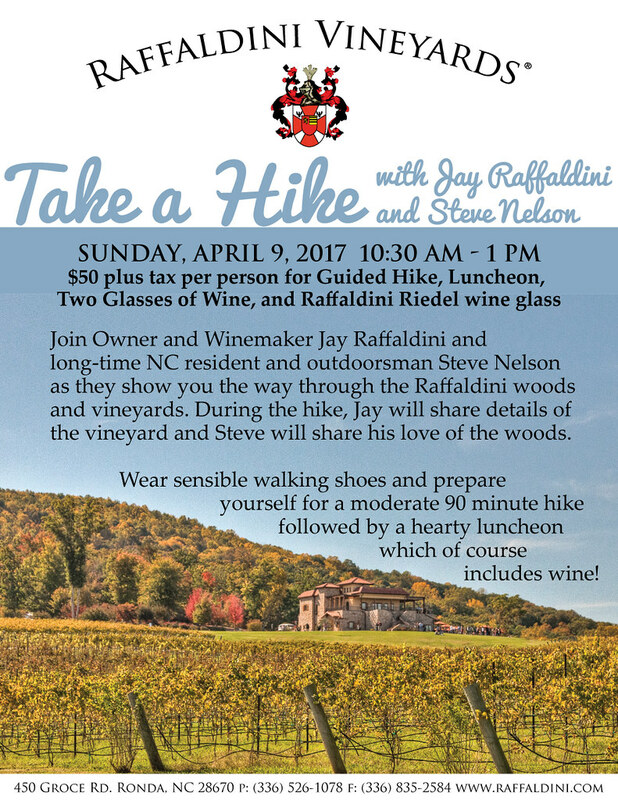 Join Owner and Winemaker Jay Raffaldini and long time NC resident and outdoorsman Steve Nelson as they take you on a moderate hike around the Raffaldini property! Wear sensible walking shoes and prepare yourself for a delightful morning out. Enjoy a unique vineyard perspective as you hike through the woods and up the hill overlooking the vineyard and Blue Ridge Mountains. The hike will be followed by a hearty luncheon of soup and fresh Italian breads paired with Raffaldini wine. Forty-five dollars plus tax per person includes hike, lunch and two glasses of wine. This event is for those aged 21 and over. Stop by the tasting room, visit our web site, call 336.526.1078 or email us for more information or to make a reservation. 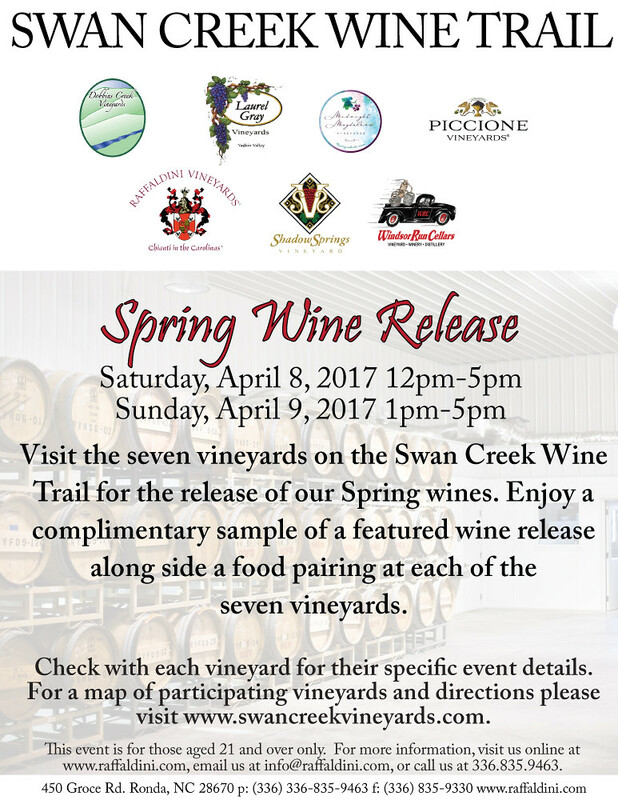 Join the Vineyards of Swan Creek for the release of our Spring Wines. On Saturday & Sunday, enjoy a complimentary sample of a featured wine release alongside a sample food pairing at each of the five Vineyards of Swan Creek. Check with each vineyard for their specific event details. For a map of participating vineyards and directions please visit the Vineyards of Swan Creek website. This event is for those aged 21 and over. Stop by the tasting room, visit our web site, call 336.526.1078 or email us for more information. The tradition of la ruzzola, which dates back to the ancient Etruscans is still played on Little Easter in many small towns across Italy. Join in the rolling of the cheese with your entire family to celebrate Little Easter and the arrival of Spring! 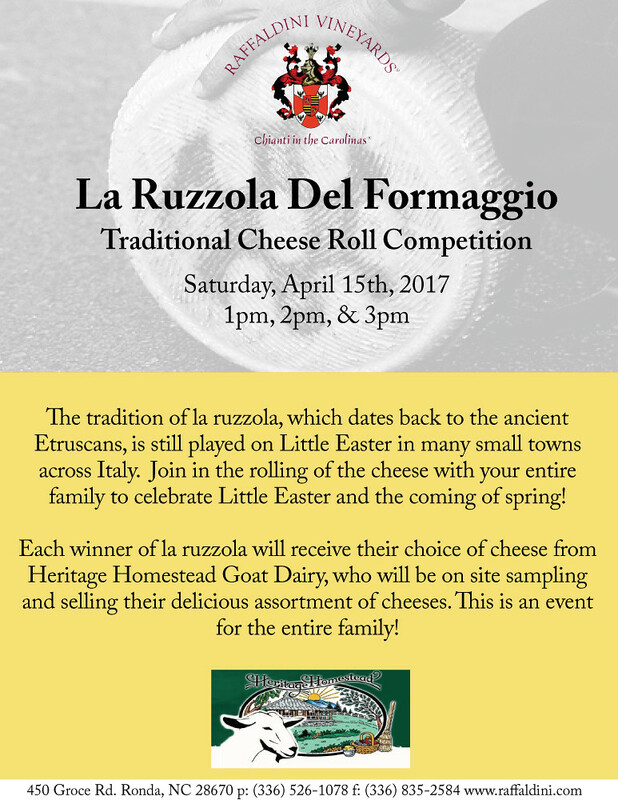 Each winner of la ruzzola will receive their choice of cheese from Heritage Homestead Goat Dairy, who will be on-site sampling and selling their delicious assortment of cheeses. This is an event for the entire family. Stop by the tasting room, visit our web site, call 336.526.1078 or email us for more information. Attention animal lovers! 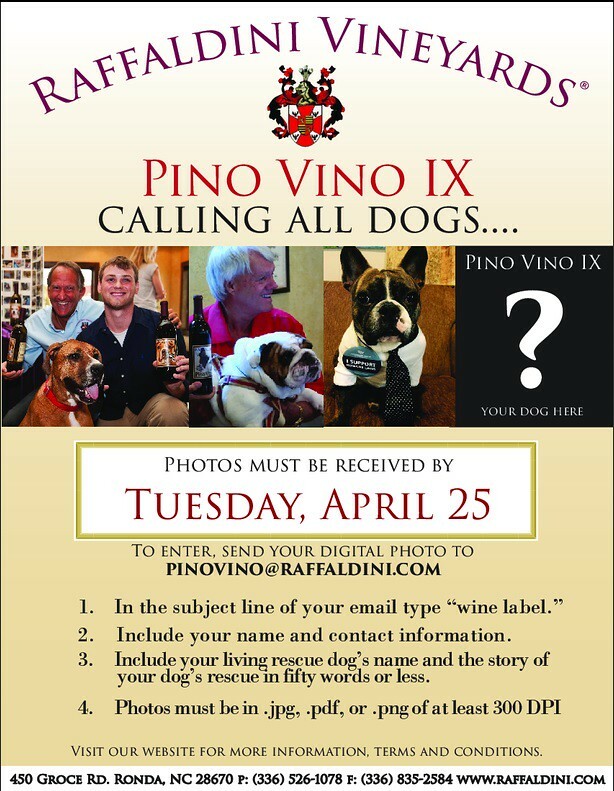 Raffaldini Vineyards is searching for a rescue dog to be featured on the label of its red wine, Pino Vino IX. Part of the proceeds of the sale of this wine benefit local animal rescue organizations. Raffaldini Vineyards Pino Vino I through VIII wines each featured a picture of a rescue dog that was chosen from entries submitted by their owners. Pino Vino IX will feature the picture of the winning dog chosen from this year’s entries. The wine will be released at a special unveiling ceremony on Saturday, June 17. Send us a photo of your rescue dog along with a story in 50 words or less. Entries must be received by April 25th. Share your love of Raffaldini wines. 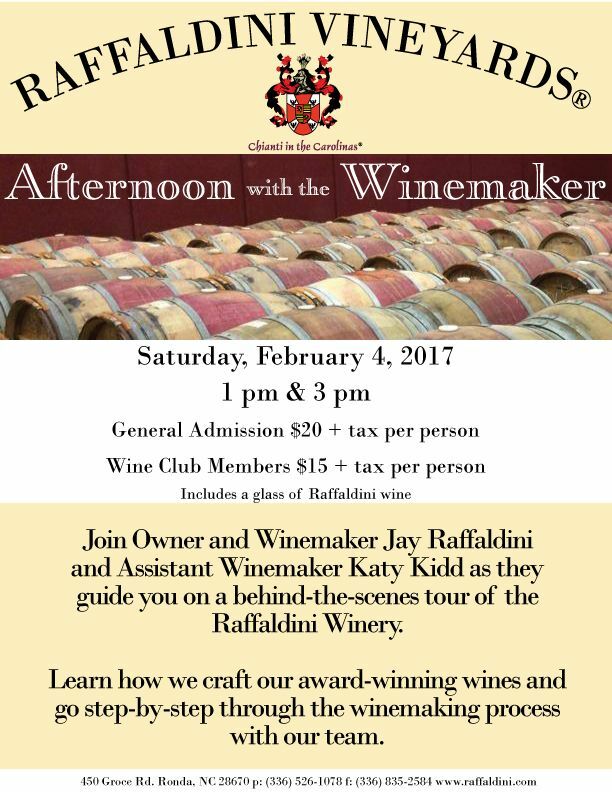 Bring your friends and family to spend the afternoon at the winery with Owner and Winemaker, Jay Raffaldini. While you are there, tour the winery and taste directly from the barrel. For every wine club you refer, you will be entered into a raffle to win some prizes. Stop by the tasting room, visit our web site, call 336.526.1078 or email us for more information. We are excited to announce the release of our 2017 Spring Wine Club Package containing the inaugural release of our newest red varietal, Sagrantino. This varietal hails from Umbria and is one of the rarest in the world with less than one-thousand acres planted worldwide. Our debut Sagrantino is from the spectacular 2015 vintage that was hot and dry, just like in Sagrantino's native Umbria. The Spring Wine Club Package will also contain the 2016 vintage of our classic white, Vermentino Superiore, and the 2015 Bella Misto. In addition to the wines, each package contains a letter from the Raffaldini Family, winemaker's notes and recipes to pair with the wines, a list of upcoming events including an invitation to our Summer Four Seasons Wine Tasting Dinner. We’ve recently rolled out a new, fully-integrated guest relations management system. For your security, we ask that everyone please take a brief moment to create a new login and password. We here at Raffaldini Vineyards are very excited to introduce this new system which will enhance the customer experience. Thank you in advance for your cooperation. Food Truck Season is Here! 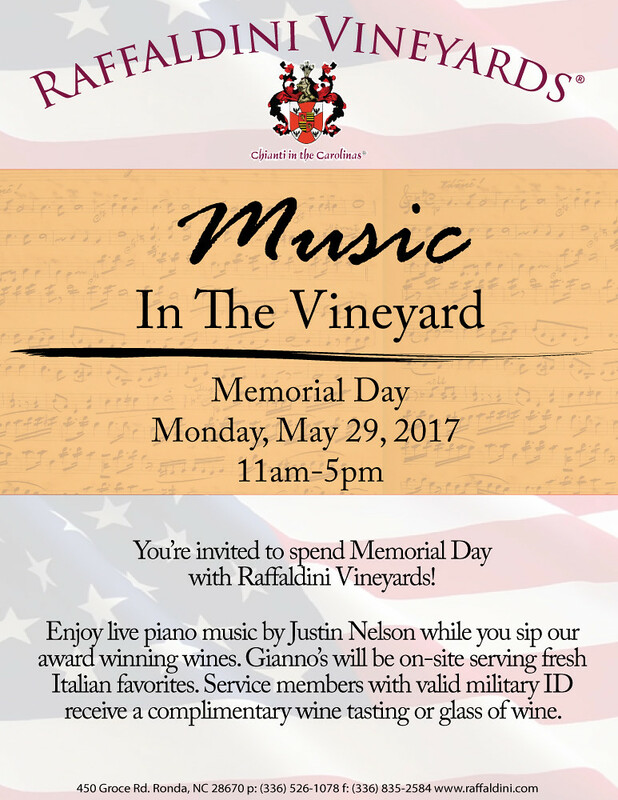 Raffaldini Vineyards is open year-round and there is something for everyone on our full 2017 Events Calendar. Check out our calendar for the perfect Spring outing. Ronda, N.C., March 22, 2017—Attention animal lovers! 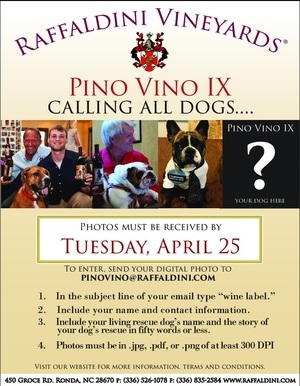 Raffaldini Vineyards is searching for a rescue dog to feature on the label of its red wine, Pino Vino IX. This is the ninth release of Pino Vino, and like previous vintages, a portion of Pino Vino IX wine sales is donated to local, no kill animal rescue organizations in support of all rescue animals. 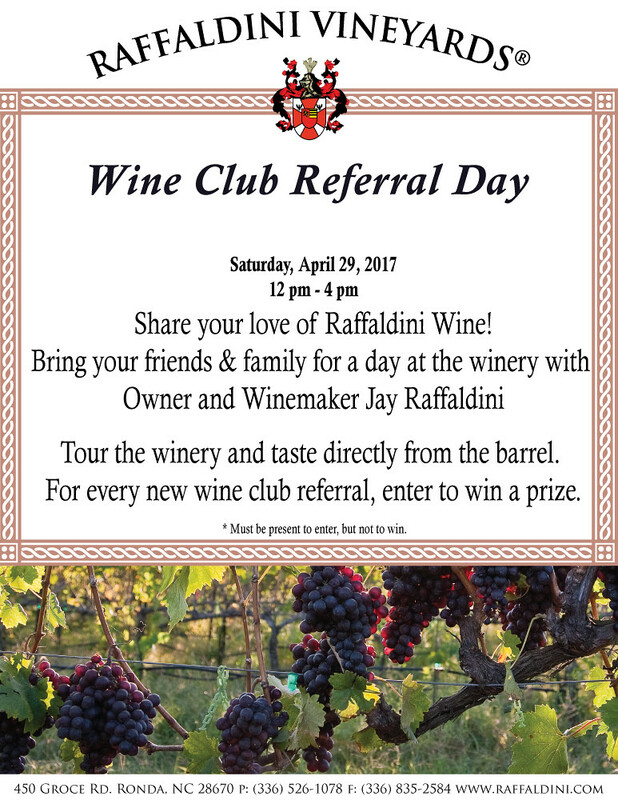 Raffaldini Vineyards is accepting submissions of rescue dogs until April 30, 2017. The winning rescue dog will be revealed at a special unveiling ceremony at 1pm on Saturday, June 17. Entries can be sent to pinovino@raffaldini.com. Please include your name, contact information, your dog’s name, a digital photo of your rescue dog, and their rescue story in 50 words or less. The Pino Vino IX winner will be notified on May 5. 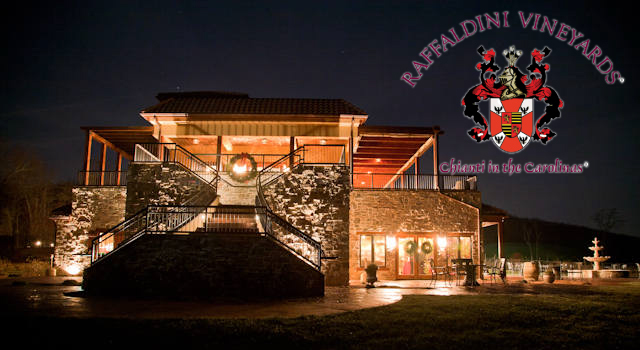 One of Wine Business Monthly’s Top Ten Hot Small Brands in North America, family-owned Raffaldini Vineyards is known as “Chianti in the Carolinas,” producing Central and Southern Italian varietals such as Vermentino, Pinot Grigio, Sangiovese and Montepulciano. This year, the Raffaldini Montepulciano Riserva was named “Best in Show” and “Best Red Vinifera” at the NC Fine Wines Competition. Raffaldini hosts public and private events throughout the year. 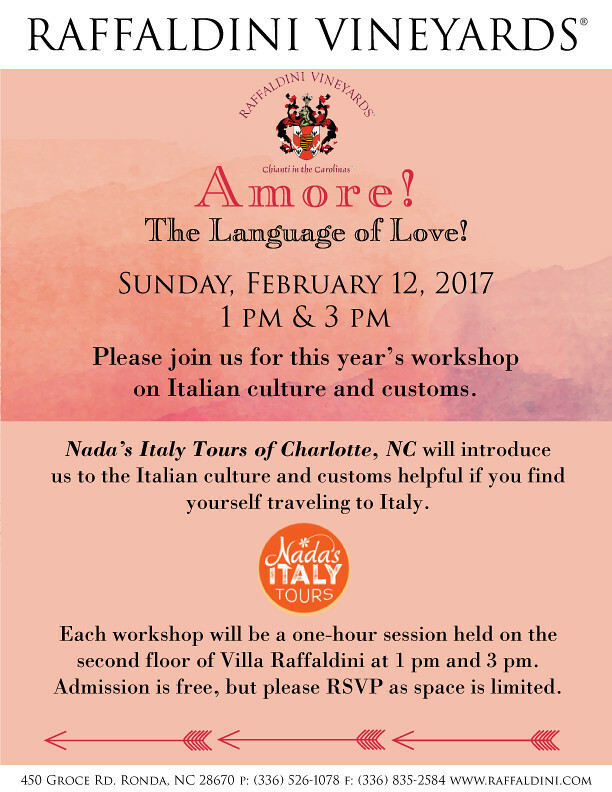 Visit the web site, www.raffaldini.com, call 336.835.9463 or email info@raffaldini.com for more information. 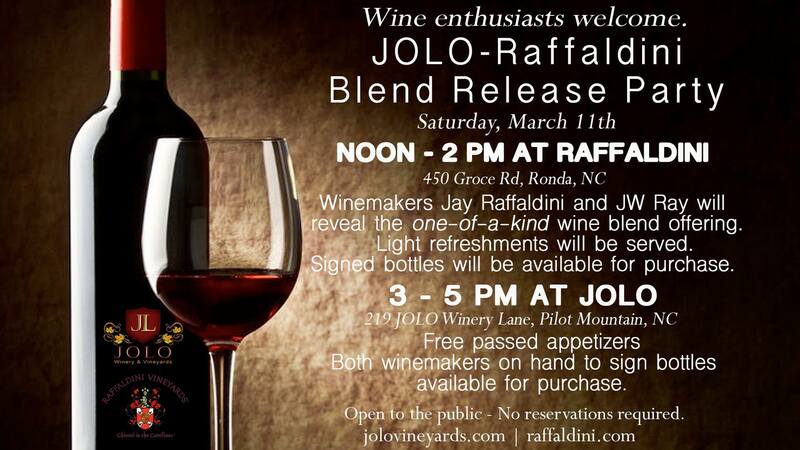 Ronda, N.C., March 8, 2017 – JOLO Vineyards in Pilot Mountain and Raffaldini Vineyards in Ronda will release a special wine commemorating the friendship of owners JW Ray and Jay Raffaldini on Saturday, March 11th. The wine is a collaboration among long-time friends, JW Ray and Jay Raffaldini, two of the Yadkin Valley’s most passionate winemakers. Raffaldini and Ray are dedicated to producing ultra-premium wine and believe deeply in the incredible potential of this wine region. The wines contents, name and packaging are being kept secret until release day. The day’s events kick off at noon at Raffaldini Vineyards where Raffaldini and Ray will lead an intimate gathering, discussing the winemaking technique and their personal stories over light refreshments. At 3p.m. the party moves to JOLO for more storytelling, tasting and passed hors d’oeuvres. A very limited number of bottles will be available for sale at JOLO and Raffaldini Vineyards while supplies last. Bottles are priced at $40. JOLO Winery & Vineyards is an award-winning, family-owned, boutique winery in the picturesque Yadkin Valley AVA in Pilot Mountain. We produce extraordinary wines that reflect the terroir. We are open for wine tastings most Thursdays through Sundays and we pour at many local wine tasting events throughout the year. Wines are available for purchase at the winery, on the website, and at selected retail locations. Known as “Chianti in the Carolinas” Raffaldini currently produces North Carolina’s highest rated red wine, Sangiovese, and other varieties including Vermentino, Pinot Grigio and Montepulciano. Raffaldini hosts public and private events throughout the year. Please visit our web site, www.raffaldini.com, call 336.835.9463 or email info@raffaldini.com for more information. Our 2014 Montepulciano Riserva took home top honors at the North Carolina Fine Wines Society inaugural competition on Saturday, February 18th. Our 2014 Sangiovese Classico was also named one of the top 12 wines in North Carolina and awarded a coveted space in the NC Fine Wines Case. All of the wines that we submitted earned medals, including Montepulciano Riserva, Sangiovese Classico, Grande Riserva, Vermentino Superiore and Girasole. Our friend James Suckling recently tasted and scored a round of our current vintages. James awarded our Grande Riserva 89 points and described the wine as "a fun and fascinating blend of montepulciano-based red with dried fruit, stem and rose petal character. Medium to full body, plenty of fruit and a savory finish. Shows promise. Drink now." Montepulciano Riserva 2014, Best In Show, Best Red Vinifera - NC Fine Wines; 89 Points, James Suckling. "A medium fruity wine with firm tannins and a juicy undertone. Tangy acidity and a clean finish. 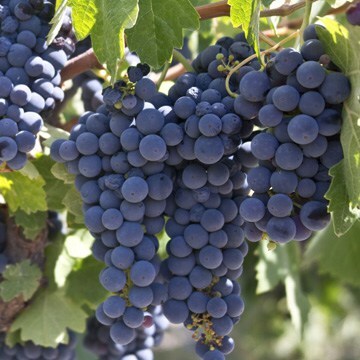 Has the earthy, fruity character of montepulciano. Drink now." Sangiovese Classico 2014 - NC Fine Wines Case Award. 88 points, James Suckling. "Good quality with dried berry, orange peel and cedar character. Medium body, light tannins and savory finish. Drink and enjoy." We are excited to announce the release of our 2017 Spring Wine Club Package containing the inaugural release of our newest red varietal, Sagrantino. This varietal hails from Umbria and is one of the rarest in the world with less than one-thousand acres planted worldwide. Our debut Sagrantino is from the spectacular 2015 vintage that was hot and dry, just like in Sagrantino's native Umbria. The Spring Wine Club Package will also contain the 2016 vintage of our classic white, Vermentino Superiore, and the 2015 Bella Misto. In addition to the wines, each package contains a letter from the Raffaldini Family, winemaker's notes and recipes to pair with the wines, a list of upcoming events including an invitation to our Afternoon in Tuscany. We have a new, fully-integrated guest relations management system. For your security, we ask that everyone please take a brief moment to create a new login and password. We here at Raffaldini Vineyards are very excited to introduce this new system which will enhance the customer experience. Thank you in advance for your cooperation. 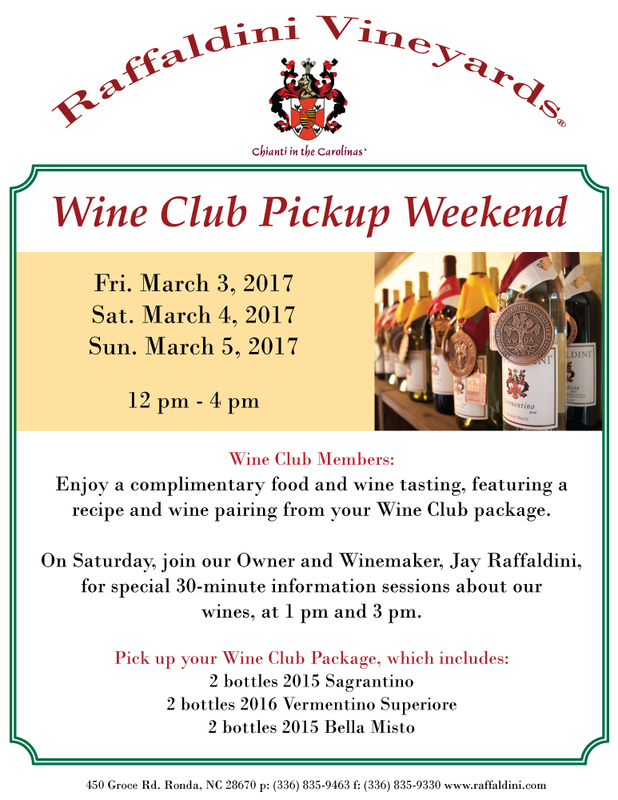 Don't miss the first opportunity to pick up your all-new Spring Wine Club package! Enjoy a complimentary food and wine tasting featuring one of the new Wine Club releases paired with a recipe from your Wine Club Package. On Saturday, join Owner and Winemaker Jay Raffaldini for a unique look into this new vintage at one of our 30-minute information sessions at 1pm and 3pm. Exclusive wine club tastings and pairings will be held from 12pm-4pm on all three days. Tasting room hours are: Friday, 11am-5pm; Saturday, 11am-5pm; and 12pm-5pm on Sunday. Stop by the tasting room, visit our web site, call 336.835.9463 or email us for more information. Secure your allocation of our highly-coveted wines by joining our wine club. Receive semi-annual, six bottle, winemaker selections of our most expressive wines. Enjoy membership benefits such as discounted tastings, event admission, and wine club member exclusive experiences. Click to sign up or learn more. 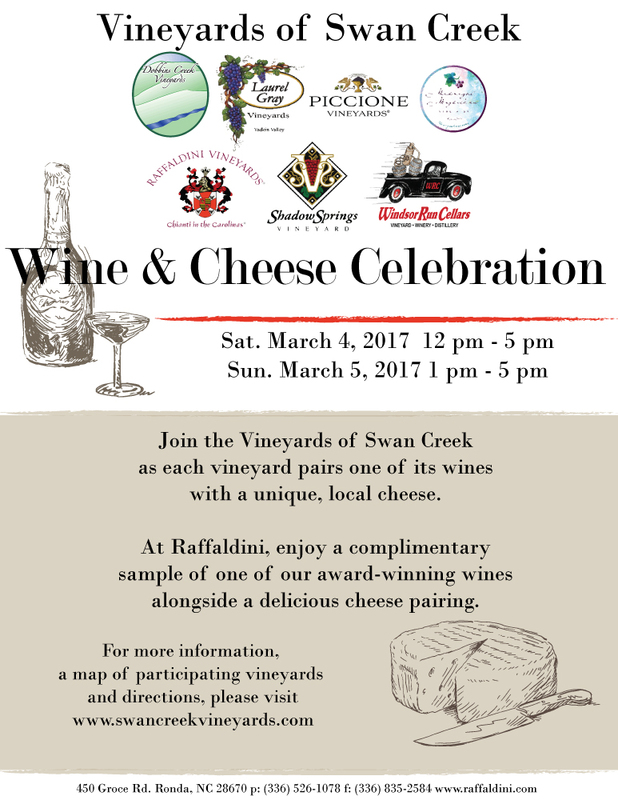 Join Raffaldini Vineyards and the Vineyards of Swan Creek as each vineyard on the Swan Creek wine trail pairs one of its wines with a unique, local cheese from Ashe County Cheese. Enjoy complimentary samples at each vineyard for a delicious way to spend your weekend. 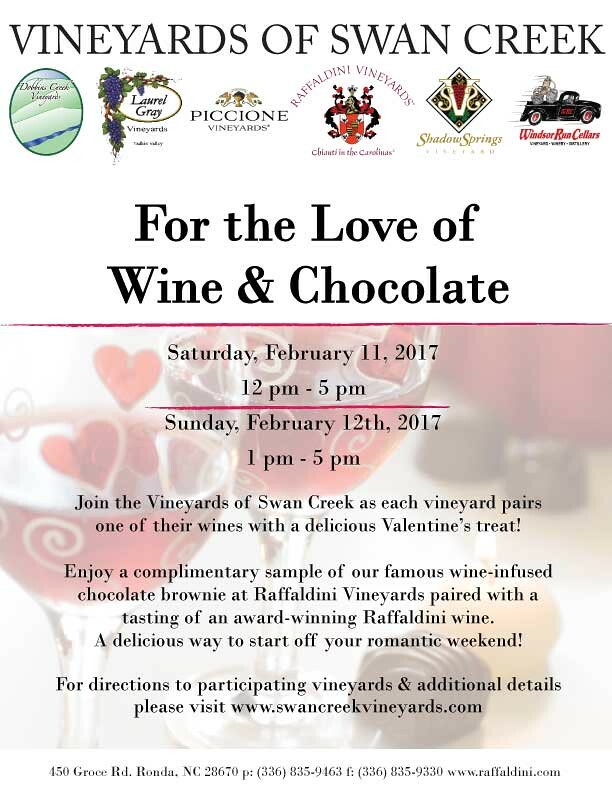 Please visit the Vineyards of Swan Creek web site for directions, details and business hours for each of the five vineyards. This event is for those aged 21 and over. Stop by the tasting room, visit our web site, call 336.835.9463 or email us for more information. 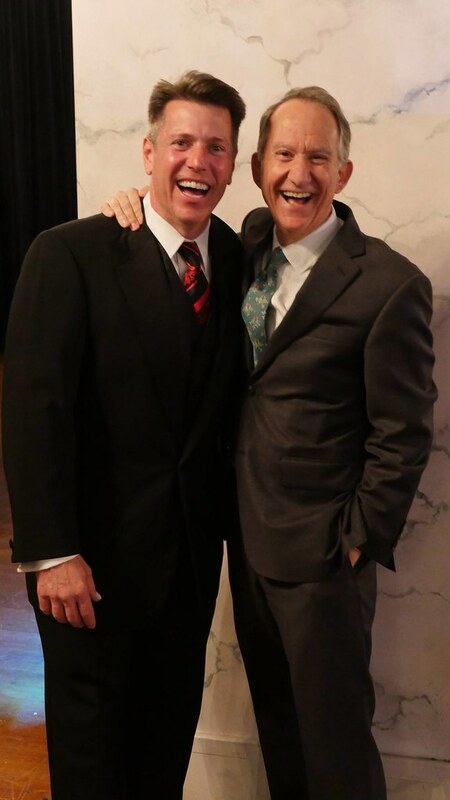 JOLO Vineyards in Pilot Mountain and Raffaldini Vineyards in Ronda will release a special wine commemorating the friendship of owners JW Ray and Jay Raffaldini on Saturday, March 11th. The collaboration features two of the Yadkin Valley’s most passionate winemakers. Raffaldini and Ray are dedicated to producing ultra-premium wine and believe deeply in the incredible potential of this wine region. The wines contents, name and packaging are being kept secret until release day. The day’s events kick off at noon at Raffaldini Vineyards where Raffaldini and Ray will lead an intimate gathering, discussing the winemaking technique and their personal stories over light refreshments. At 3p.m. the party moves to JOLO for more storytelling, tasting and passed hors d’oeuvres. A very limited number of bottles will be available for sale at JOLO and Raffaldini Vineyards while supplies last. Bottles are priced at $40. 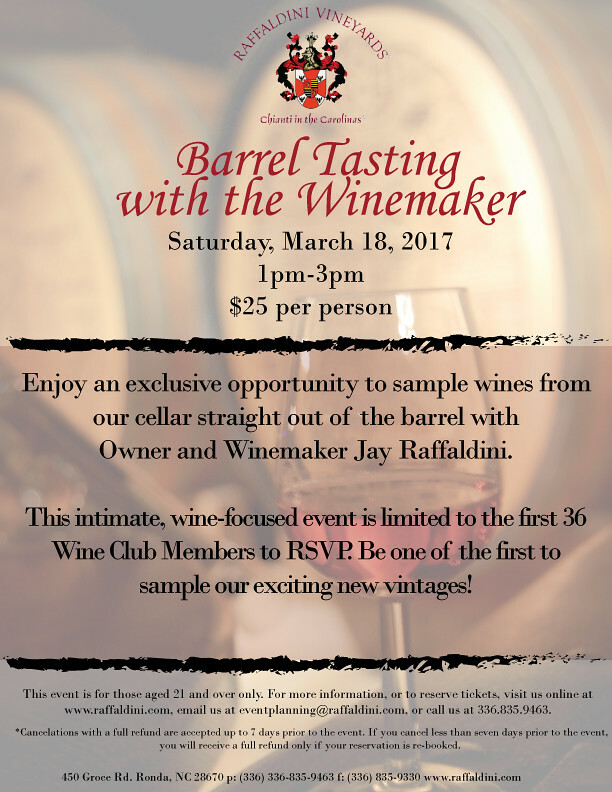 Join Owner and Winemaker Jay Raffaldini at The Duke Mansion on Tuesday March 14 from 5:30p.m. - 7:30p.m. to taste the 12 best North Carolina wines accompanied by succulent hors d'oeuvres, including our 2014 Montepulciano Riserva, named Best in Show and Best Red Vinifera Wine, and the 2014 Sangiovese Classico. Both wines are a part of the twelve wines making up the NC Fine Wines Case which includes wines from Addison Farms Vineyards, Cellar 4201, Grove Winery, Herrera Vineyards, Jones Von Drehle, Raffaldini Vineyards, Shelton Vineyards, and Surry Cellars. The winning vineyards from the NC Fine Wines Competition will pour the best wines that North Carolina has to offer and tell the story behind each one, along with great food and ambiance offered in these locations. This is a great educational and networking opportunity for wine lovers to increase their knowledge of the quality of North Carolina wines and interact directly with the owners and winemakers that made them. Tickets to this showcase event are limited and will sell out quickly. The Duke Mansion would love for you to continue your evening in their restaurant and spend the night in their AAA Four Diamond-rated hotel. Enjoy an exclusive opportunity to sample wines from our cellar straight out of the barrel with Owner and Winemaker Jay Raffaldini. This intimate, wine-focused event is limited to the first 36 Wine Club Members to RSVP. Be among the first to sample our exciting new vintages! Stop by the tasting room, visit our web site, call 336.526.1078 or email us for more information or to make a reservation. 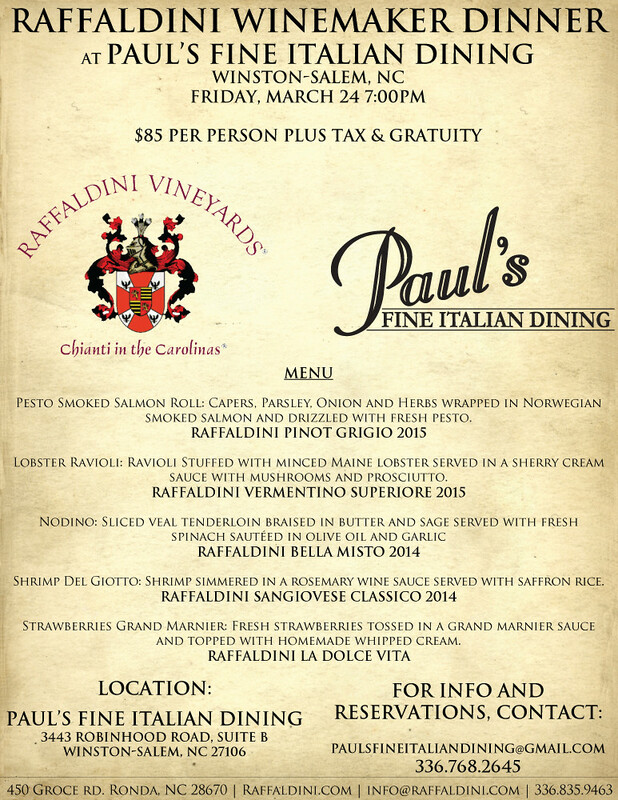 Join Raffaldini Vineyards as we partner with Paul's Fine Italian Dining in Winston-Salem for an incredible wine and food experience. 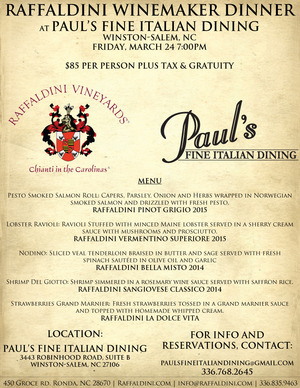 Guests will have the opportunity to dine alongside Owner and Winemaker Jay Raffaldini while he serves up the latest releases from Raffaldini Vineyards and describe the winemaking techniques that make Raffaldini Vineyards unique. Click on the menu to learn more or contact Paul's to make your reservation. Make Reservations Now. Space is filling up fast! the 12 best North Carolina wines accompanied by succulent hors d'oeuvres, including our 2014 Montepulciano Riserva, named Best in Show and Best Red Vinifera Wine, and the 2014 Sangiovese Classico. Both wines are a part of the twelve wines making up the NC Fine Wines Case which includes wines from Addison Farms Vineyards, Cellar 4201, Grove Winery, Herrera Vineyards, Jones Von Drehle, Raffaldini Vineyards, Shelton Vineyards, and Surry Cellars. 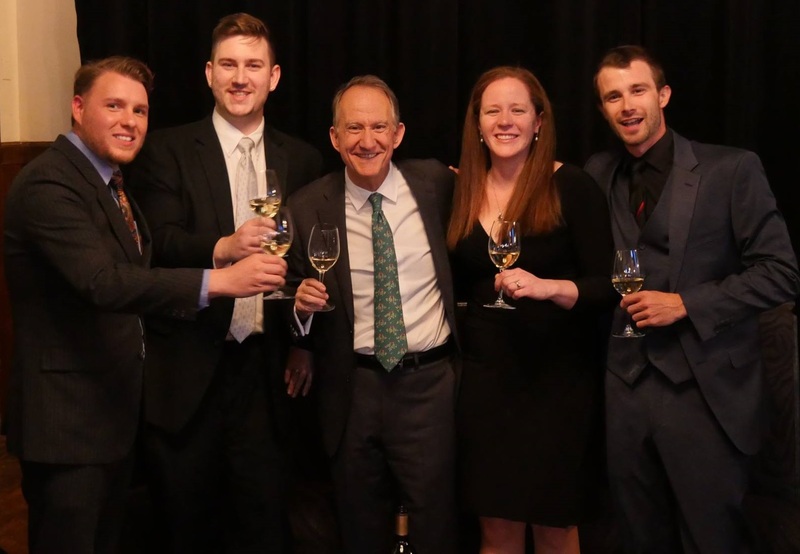 The winning vineyards from the NC Fine Wines Competition will pour the best wines that North Carolina has to offer and tell the story behind each one, along with great food and ambiance offered in these locations. 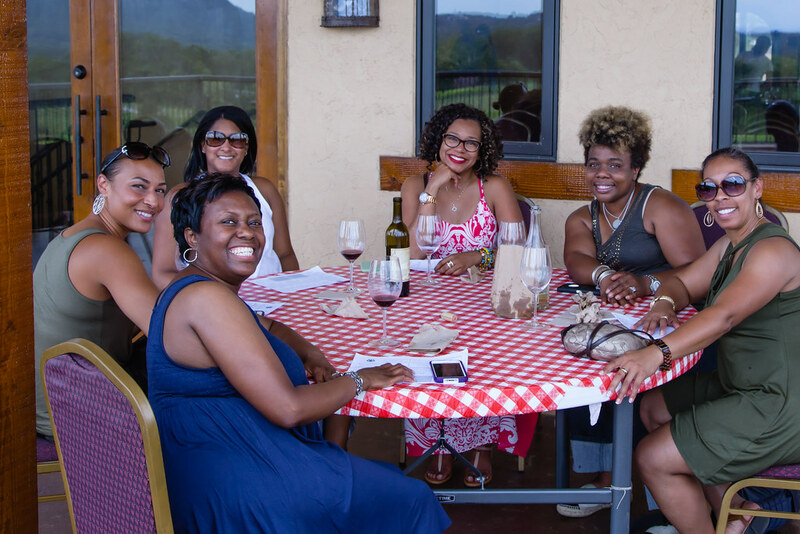 This is a great educational and networking opportunity for wine lovers to increase their knowledge of the quality of North Carolina wines and interact directly with the owners and winemakers that made them. Tickets to this showcase event are limited and will sell out quickly. The Omni Grove Park Inn would love for you to continue your evening in their restaurant and spend the night in their AAA Four Diamond Rated Hotel. 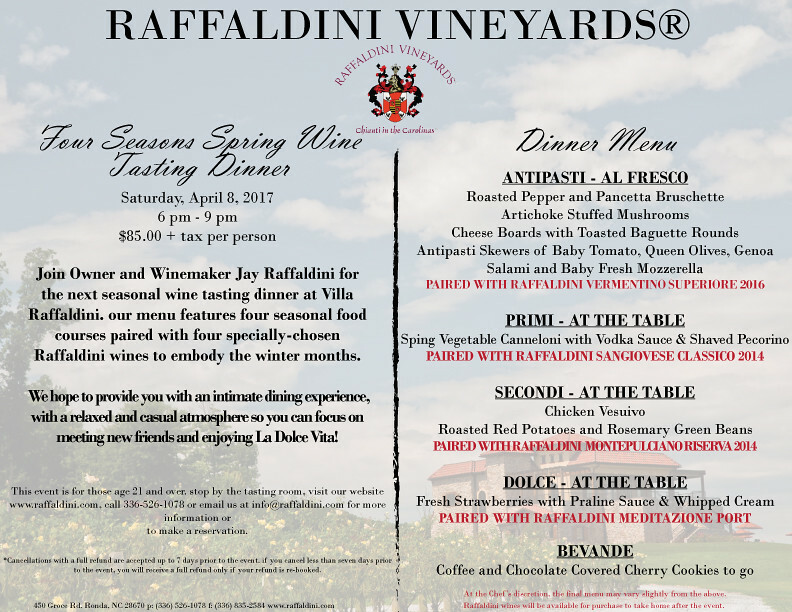 Join Owner and Winemaker Jay Raffaldini for the next quarterly wine tasting dinner held at our beautiful, Tuscan-style Villa Raffaldini. We have created the perfect menu to feature four seasonal food courses alongside four specially-chosen Raffaldini wines to embody the Spring months. Delight in a bountiful antipasti display while mingling with new friends by on the breathaking Piazza overlooking the Brushy Mountains. All remaining courses will be served downstairs to create an intimate dining experience, with a relaxed and casual atmosphere so you can focus on meeting new friends and enjoying La Dolce Vita. Owner and Winemaker Jay Raffaldini will provide culinary and wine descriptions for each course to make this dinner truly unique and special. This event is for those age 21 and over. Stop by the tasting room, visit our website, call 336.526.1078 or email us for more information or to make a reservation. *Cancelations with a full refund are accepted up to 7 days prior to the event. If you cancel less than seven days prior to the event, you will receive a full refund only if your reservation is re-booked. The hike will be followed by a hearty luncheon of soup and fresh Italian breads paired with Raffaldini wine. Fifty dollars plus tax per person includes hike, lunch and two glasses of wine. This event is for those aged 21 and over. Stop by the tasting room, visit our web site, call 336.526.1078 or email us for more information or to make a reservation. *Cancelations with a full refund are accepted up to 7 days prior to the event. If you cancel less than seven days prior to the event, you will receive a full refund only if your reservation is re-booked. Celebrate Little Easter and the return of Spring at Raffaldini Vineyards with the Italian tradition of rolling the cheese! The tradition of la ruzzola dates back 3,000 years to the Etruscan Tomb of the Olympiads but is now played with each Pasquetta in select Italian villages. Each winner of la ruzzola will win their choice of cheese from Heritage Homestead Goat Dairy. Heritage Homestead will be on-site sampling and selling their delicious assorted cheeses. This is an event for the entire family! 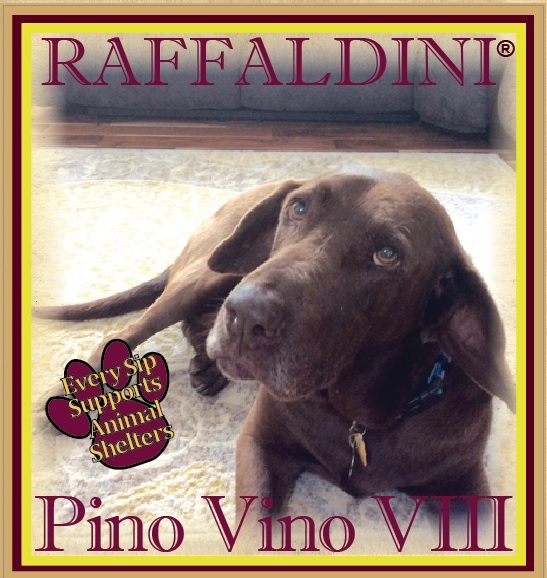 Sales of Raffaldini Vineyards' Pino Vino I - VIII helped benefit all animals in need through donations to local animal rescue organizations. 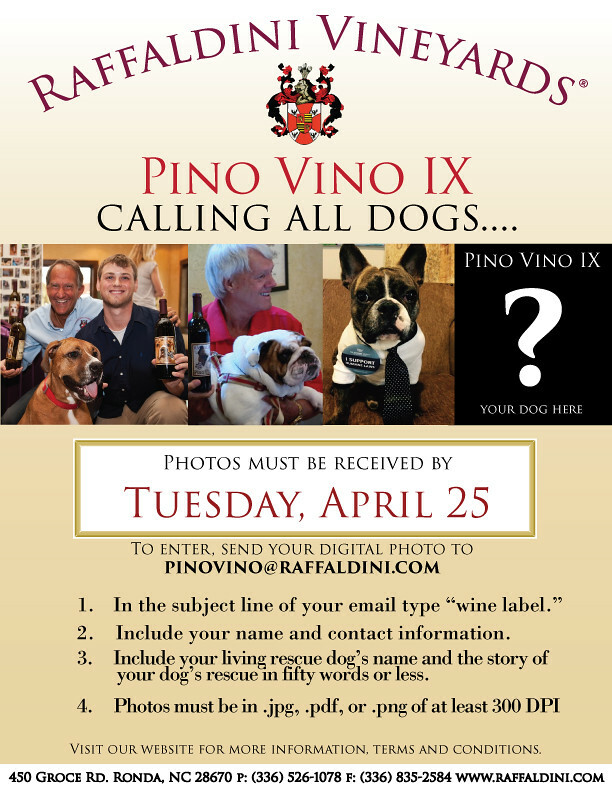 If you have a rescue dog that you would like to be considered for the Pino Vino IX label, send us a photo and back story in 50 words or less between February 1-April 25. An independent panel of judges will narrow down the entries and then vote on a winner. The winning dog will then go on to represent all animals in need as the new Pino Vino ambassador featured on the label of our Pino Vino IX red wine. The winner will be revealed on the labels of Pino Vino IX at a grand unveiling ceremony on June 17, 2017.